In the last part, I have described the basic outlines of the ETF’s direct shorting strategy. We have explained that, despite the undeniable yield potential, such strategy also brings many risks that must be kept in mind. As an option seller, you have a certain obligation (in this case, to deliver a certain amount of the underlying asset to the counterparty – practically speaking, to short the ETF if the counterparty in the trade -the owner of the purchased call option decides to use its right and he buys from us the ETF for the agreed price. For this obligation, you will receive the option premium, which size depends on many factors (the distance of the strike option from the current price, time to option expiration, volatility, etc.). There are several approaches for trading a short call strategy. The following two are the basic ones and I will describe them on already known instrument VXX. I place the option (its strike) higher than the current market price (the option is then called OTM – out of the money). For the success of the whole strategy and the possibility to receive a full option premium, it is enough to have the expiration price lower than a chosen strike. Simply said- it is enough when nothing essential (in this case, growth) happens. E.g. the current price of VXX is 27.44, if I sell the call option with June expiration (150 days expiration) with the strike 50, I will receive the option premium of about 200 USD per contract. Placing the option below the current market price (option is ITM – in the money) – we might get a much higher premium for such an option. However, to have the right to keep the whole premium, the market price must drop down below the option strike chosen by us. 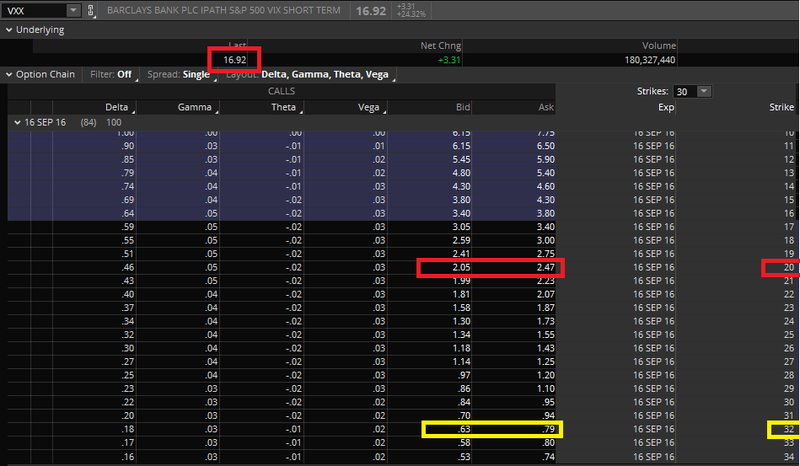 If I would sell at the current market conditions an ITM option with the strike 20, I would potentially receive a premium of $ 850 per contract, but in order to be profitable, the VXX price must be below 20 during the June expiration. This is an aggressive type of trade where I expect that the VXX will continue to fall apart due to the contango and at the same time there will be no increased volatility in the market that would push the VXX price significantly upwards. 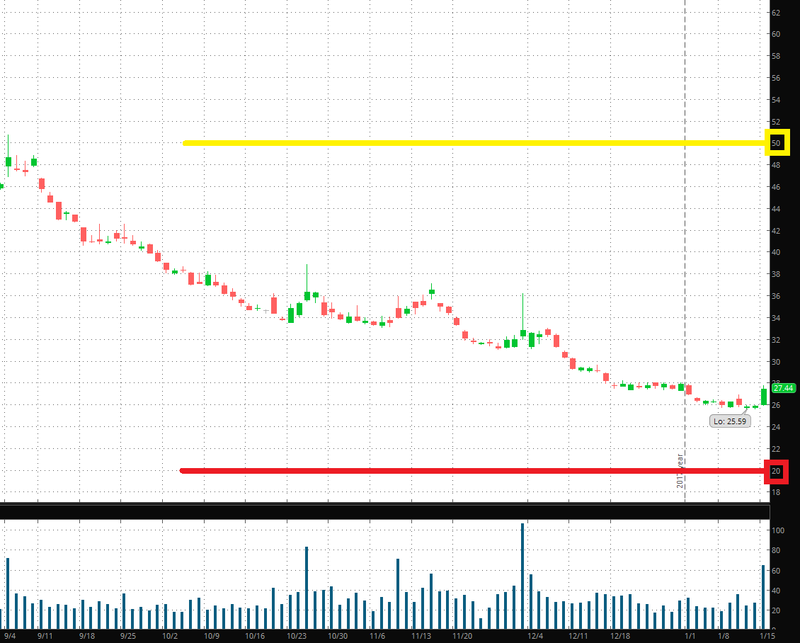 To make it clearer, here, in the VXX price chart, you can see the levels of the two option strikes. I will dedicate some other part of our series to the process of selecting the optimal strike level of the sold option – with respect to an optimal combination of the amount received and the probability of success (that is, the ETF prize will end up under the strike of the sold option). Of course, I believe that it is quite clear that the collected premium depends much on the actual value of the underlying asset, or on volatility. It will, therefore, be significantly higher when the market is in spike – ideally short-term upward swings (as it is normal in the case of volatile ETFs). Let me now show you a comparison of the option prices in the period around Brexit, which I have already written about in the previous article. To compare the difference of the option premiums, I consider 2 extremes – the local minimum here on 7.6.2016 and the day following the announcement of the Brexit’s results – 24.6.2016, when the volatility had increased significantly (see the yellow-marked candles in the following chart). 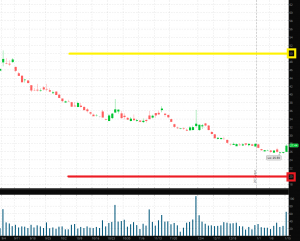 (Note: Do not be misunderstood by the different pricing of the VXX instrument in the price chart above and in the examples below, the current price is recalculated by the so-called reverse splits, which in the period from 6/2016 till now already happened twice – in both cases it was a reverse split price 4: 1, so all strikes listed in the examples below must be multiplied by the coefficient 16). 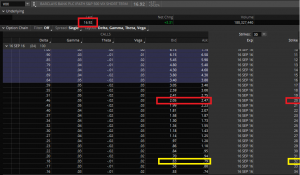 If, in the first case, ie at a low volatility level, we would have sold the call option with strike 20 (from today’s point of view is the price 320, see note above) and for the September expiration we would receive a premium of 0.62, that is $ 62. On the other hand, after announcing the voting results and with the increased volatility, we would have received for the same strike 20 a premium of more than three times the equivalent of 2.05, ie $ 205 per 1 option contract. For the record, we would get an identical premium as in the first case for selling a call option with distant strike 32, ie almost 90% from the VXX market price. Of course, hindsight is 20/20 and this comparison is not meant to show you the best entry moment in the market. This comparison has the goal to demonstrate that the timing of entry into the position is crucial for the performance of such a strategy. I will deal with this topic in some (or rather some more) other works – in the fund we use our own solution, which chooses the optimal option position with regard to premiums received, and on the other hand, also considering the probability of success of such a trade, the level volatility, etc .. However, a higher price of the underlying asset does not only mean a more advantageous entry for such uncovered option strategy, but these conclusions also apply to option structures that are fully secured (eg, vertical spreads). Many traders, I have explained the principle of this trading strategy to, have a big problem with keeping the risk management principles that are crucial to successful trading in the long run. Of course, looking at the long-term chart of instruments such as VXX, UVXY, UNG, and other inefficient ETF / ETNs, many traders have the impression that nothing crucial can happen. Believe me, it can – and I do not necessarily mean 2008 or 2011 and huge increases in the market volatility. Frequently, even the short-term volatile periods, which we have been experiencing quite a lot in last “very quiet years”, can make with an incorrectly managed strategy unbelievable mess in the portfolio. I close my position (“stop-loss”, for example, at the level of the received option premium) and no further actions are coming from my side. Of course, the list of possible variants is not complete, there are many other adjustment and position management techniques. But it is important to know and have a plan for all possible cases. A detailed description of money-management will be described in other works of this series. Finally, allow me a small summary of the advantages and disadvantages of the short call strategy. The margin requirement is usually smaller than in the case of classic short.